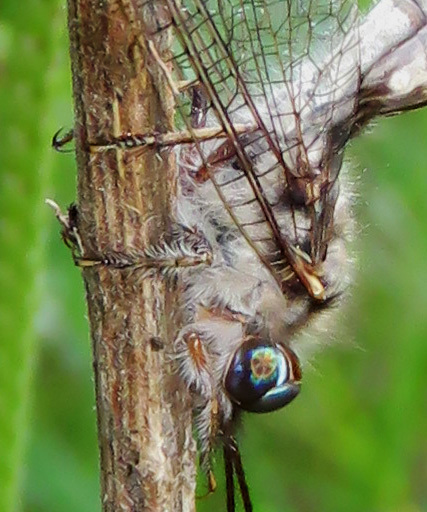 …would have to be an Owlfly, wouldn’t it? I saw this insect fly past today and land on a stalk. It looked long and skinny and plastered itself against the stalk, but as I drew closer for a look, it extended its abdomen out at an angle, which made it look like a broken twig. Or maybe a gymnast getting ready for Rio. Bug disguising itself as a twig. I coaxed my sheep Romy into position in a futile attempt to have a solid background to aid in focusing. 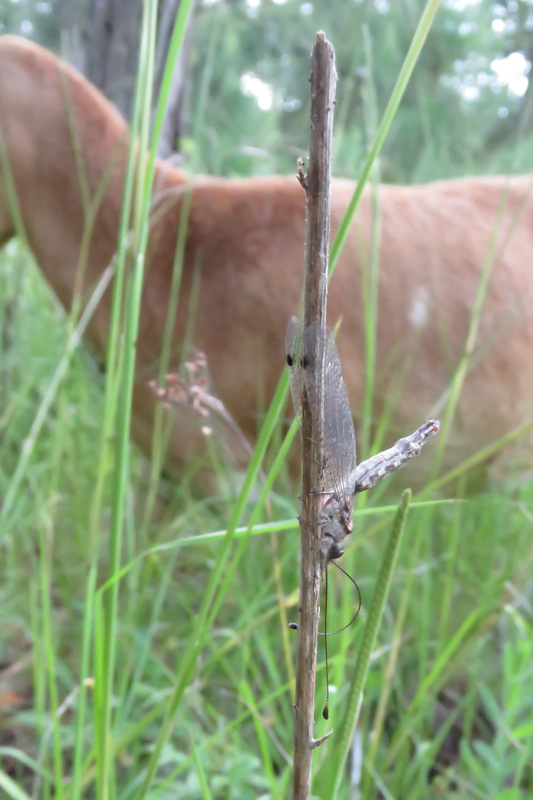 Then I saw dragonfly-type wings, but very long butterfly-like antennae. My camera doesn’t seem to like to focus on vertical objects so it took me a while to get pictures, and the insect kept sidling around the stalk to get away from me. Finally I got a few photos, which revealed huge, divided eyes. Divided eyes and a very fuzzy body. I have never seen one of these before, but it reminded me of a Dobsonfly, and sure enough, I found it sharing the page with those and fishflies. Other insects in their order are ant lions and lacewings. 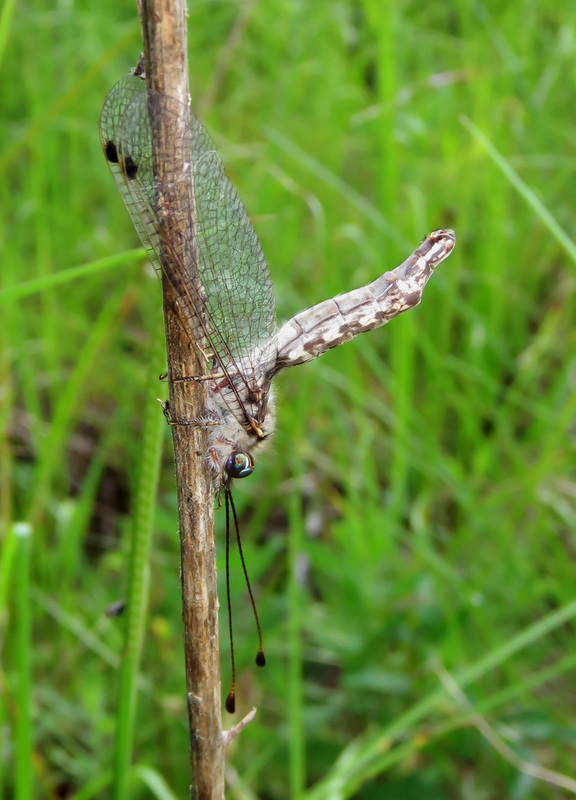 According to a page on BugGuide.net, all of the owlflies in Texas are the genus Ululodes, and they can’t be classified further from pictures. They are most often seen at night, but this one was out and about at 4:30 pm. Kaufman’s Field Guide to the Insects of North America says they are strong predators, almost equal to dragonflies, but it does not say what they eat. Insects of the Texas Lost Pines says their natural prey is unknown, but that they eat robber flies (which are also predators) in captivity. I will have to keep an eye out and see if I can discover their prey! Your pics – as always – are brilliant. Such a fascinating creature – those huge eyes, and such a fuzzy body!